To honor the upcoming elections this weekend, here is the only Hungarian party worth voting for. 1. Their logo looks ADORABLE! They are in fact so adorable that one of their posters says "So adorable, we are sure he will not steal from you." 2. Their official slogan is: "Tow tails, two feet, one way!" 3. Their election slogans crop up all over Hungary, and they are freaking hilarious. Talk about guerrilla PR. Poster on the lest says "We will promise you anything!" Poster on the right says "More everything, less nothing!" - "We won't have to work but there still will be money!" - "I found a drunk beaver." - "I found a wallet! Good for me!" - "We want yesterday tomorrow!" - Squiggly lines with a footnote saying "This is for the Martians! Stop reading!" - A soon-to-open store in downtown Budapest selling used clothes from Africa. - "Elizabethtown is for Elizabeths!" (one of the districts in Budapest where they actually had people running in the elections, campaigning to rename every resident Elizabeth). 6. 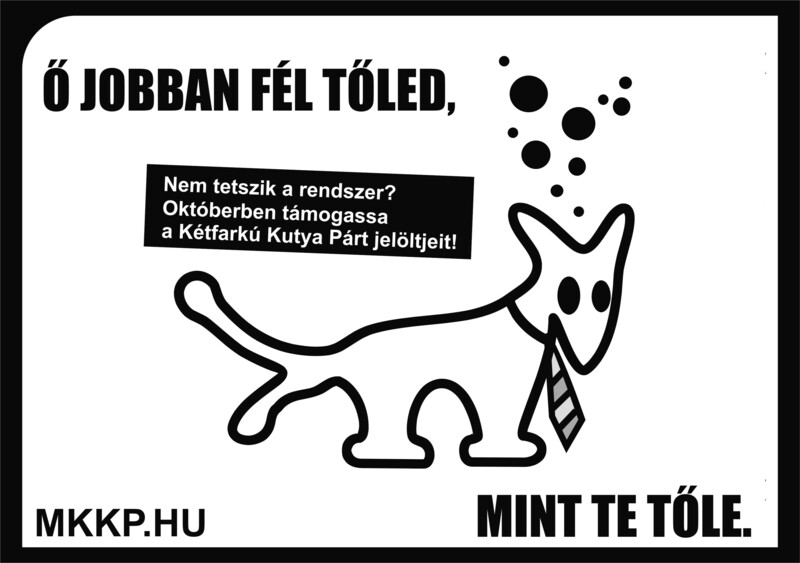 Their official opposition is the One-tailed Dog Party (Egyfarkú Kutya Párt). I want more everything and less nothing. Thanks for stopping by my blog. The campaign posters sounded great. I love this party. I wish we had such a humorous take on elections like this in the states. I have some stones. Point me to the nearest pyramid workshop please! "We will promise you anything!" should be on most US campaign posters. So, A to Z is over. But wait! There is more! W is for the Water Spider! E is for the Eurovision Song Contest!